Pope Francis continues to impress me. Since he ascended to the papacy, he has earned the respect of Catholics and non-Catholics around the world and has single-handedly restored dignity not only to the Catholic Church but to organized religion. I have been impressed with Pope Francis’s humility, compassion and the moral clarity with which he speaks. 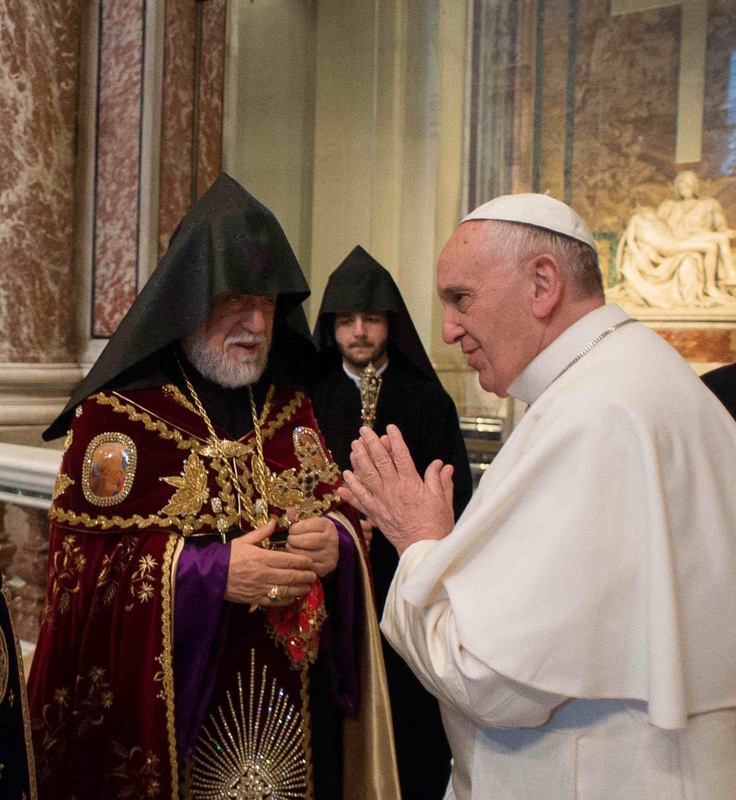 It has been 100 years since World War I was raging in Europe, and at a mass last Sunday the Pope commemorated the start of the mass murder of some 1.5 million Armenian Christians by the Ottoman Turks. The government of Turkey takes offense when people call this systematic mass murder a genocide. They prefer to whitewash history, and governments and non-governmental organizations, including many Jewish organizations, have avoided referring to this historic atrocity by what it truly was and so avoid a row with the Turkish government. In this context, it was truly remarkable that Pope Francis this week spoke about what is “widely considered the first genocide of the 20th century.” Turkey promptly recalled its ambassador to the Vatican, and the Pope’s use of the word “genocide” has created a diplomatic row. Pope Francis didn’t stop there. He put the Armenian genocide in the context of setting the stage for the Shoah that decimated the Jewish people, Stalin’s mass murders of his people, and the current scourge of militant Islamic terror in the guise of ISIS, Boko Haram and Al Shabab. “It seems that humanity is incapable of putting a halt to the shedding of innocent blood,” Francis said. “It seems that the human family has refused to learn from its mistakes caused by the law of terror, so that today, too, there are those who attempt to eliminate others with the help of a few, and with the complicit silence of others who simply stand.” The Pope implored his listeners to hear the “muffled and forgotten cry” of endangered Christians who today are “ruthlessly put to death–decapitated, crucified, burned alive–or forced to leave their homeland.” Boston Globe columnist Jeff Jacoby writes that Pope Francis, to his credit, refuses to downplay that Armenians were victims not only of genocide but of Islamic jihad, similar to non-Muslims subjected to militant Islamic terror today. He writes that during World War I the leaders of Turkey openly boasted about their massacre of Armenian Christians and that only later as Turkey sought to curry favor with the West, did Turkey change course. However, rather than accept responsibility as post-World War II Germany did with respect to the Shoah, Turkey has stonewalled and threatened to cut off relations with anyone who refers to the Armenian genocide as genocide. I applaud the Pope for his moral courage to speak the truth. This past week, we Jews paused on Yom HaShoah to recall the brutality to our own people in Europe in the 20th century. We continue to bear witness to the unspeakable brutality and murder that our people suffered in Europe and that still scars our community. Like decent people everywhere, we are baffled that while human innovation over the last century has advanced our civilization in so many ways at the tools of innovation have been used to carry out unthinkable mass murder and brutality. Parashat Shemini comes to remind us that we as a civilization stand at the precipice between creation and destruction. Rabbi David Wolpe writes that the most important day of creation in Genesis is not the first day when God created the heaven and earth, nor the sixth day when God created human beings nor even the seventh day when God rested. Rabbi Wolpe writes that the most important day was the eighth day. We began our lives in a real sense then, on the fateful eighth day –Yom Shemini. What happened then was not so great once God turned creation over to us. Adam and Eve get in trouble; Cain and Abel have their strife; humanity completely degrades. When we turn to Leviticus, Parashat Shemini offers echoes of the fateful eighth day after creation. Only now what was created over the previous seven days was the Tabernacle and the sacrificial system. With a week’s worth of opening festivities over, it’s time to transition to regular function. It’s precisely at this time that we have the tragedy of Nadav and Avihu who perish on the altar when they bring eish zarah, strange fire. Rabbi Wolpe writes: “We are blessed and cursed with the eighth day. For as we are given the start to creation, we are also mandated to carry it forward.” On Yom HaShoah, we recall the worst “eighth day” in human history, the twelve dark years of Nazi terror in Europe. The Nazis arrogated to themselves the powers of God that have roots in the initial eighth day of creation when God let go of the reins and said to humans, you run the world. At the same time, out of the ashes of the Shoah is a glimmer of hope that humanity can muster the courage to confront evil, rebuild and affirm life. In the cause of stamping out tyranny in our world, Pope Francis was helpful in calling the Armenian genocide by it rightful name. I appreciate that a man of his stature and moral authority is not afraid to identify evil when he sees it. In a sense, he eloquently identifies the choice that we have in shaping our continuous eighth day of creation. Will we ignore evil or will we bear witness to evil and build a world of goodness, hope and love. The choice is ours. Note: At press time, the link to the quotations from Rabbi Wolpe was not working, even though I have referred to that link previously. I will try to find the correct link and embed it in this posting.